The first part of the book was a bit unexpected, but I really enjoyed, what was a nice romance. I was pleased and a little surprised, the author allowed Mariwen and Kris’s relationship to develop so well. 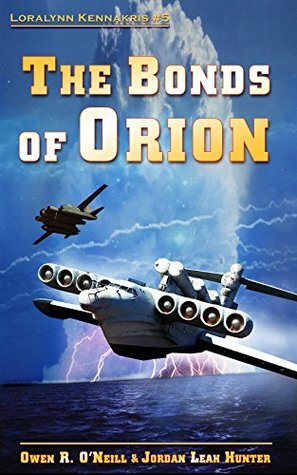 Once Kris was recalled from leave, the book changed back into the expected military SciFi novel, unfortunately this took a long time to get going. It didn’t help that the story kept switching, from Kris to ‘Colonel Yeager’ to ‘Halith’ etc. To be honest the next 50% of the book was fairly tedious, but it appeared there was going to be an interesting climax. Unfortunately, it turned out to be an anticlimax and a non-ending.After a good start it turned out to be a disappointing story, also it didn’t help that the author seems to have literary pretentions.At times I found his style of writing quite difficult to follow. It felt like he was deliberately trying to make the text confusing, sometimes there were pages that were just meaningless. I presume the author knew what they were about, but he just didn’t provide the reader with enough information for it to make sense. I could have given the first part of this book 4 stars, but the rest was very disappointing. If you are going to read this book I would recommend waiting until book 6 is out. If this isn't within the next six months I will probably come back and change this rating to 1 star. Where was the editor. I have enjoyed this series from the beginning and looked forward to the publication of this next book. The concept continues to be good but at times the book was almost unreadable. The grammatical errors, the never ending sentences and the sentences that made no sense were so disappointing. I finished the book but I had to work too hard to do it I hope the next one is better. Get it edited better and don’t rush to put it out to the public. I’d rather wait longer and enjoy the product more. Each book in this series brings with it it's own little treasures. I loved seeing Kris and Mariwen together. I loved the sweet tender moments and the super hot ones. I enjoyed the snippets of the other characters lives. LOVED the Larl! Really, this book offered so much more than the previous ones for me and that's saying something since I devoured them all. (I guess my romance side is coming out.) I'm very much looking forward to what the next book brings. I have enjoyed reading the series but this book just fell flat for me. I have found myself scheming over parts because it became redundant and overly awkward in parts. The action was non-existent and the suspense was building only at the end. It takes more than half the book for the 'main' plot to start to come into focus, and then the book ends on a cliffhanger. I wasn't very satisfied when I completed it. Owen R. O'Neill Jordan Leah Hunter Karen Boston - Owen R. O’Neil is a physicist, a writer, an amateur historian and the descendant of a long line of engineers. After three years working for the US Navy as a missile systems engineer, he became a member of the intelligence community and spent the rest of his career there. One of the last generation of Cold Warriors, he worked on topics as diverse as satellites, telecommunications, infrared semiconductors and C4ISR. He is an expert on technology projection and threat assessment, and did groundbreaking work on IW/IO before it was cool.These days he writes, exercises a passion for photography he inherited from his father, and indulges in his two principal vices: cooking 'unhealthy' food and ferreting out exceptional but under-appreciated wines. He lives on nine rural acres in northern California where, when not engaged in the foregoing, he listens to his tenants (bullfrogs and coyotes) and watches over his infant vineyard. He has written several novels and shorter works with Jordan Leah Hunter.